Painter Michael Mallard is professor of art and artist-in-residence at Union University in Jackson, Tennessee. 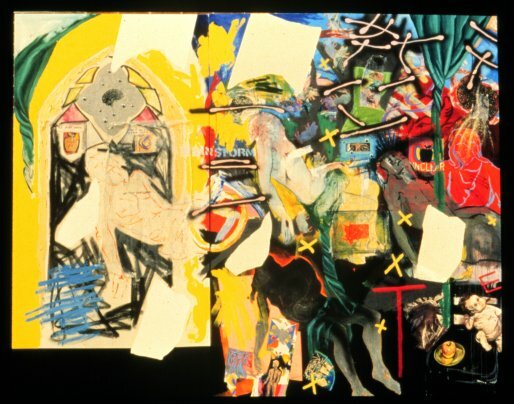 His works employ paint and collage in contemporary abstract surrealism with underlying commentary, and have been widely exhibited across the U.S. He says, "I approach my work as it represents our lives: layers of meaning developed through time. This compilation yields its quality of excessiveness. I address rather simple ideas that become complex through visual presentation." Mallard uses words as a part of his layering, explaining, "I started using words in my painting as a reaction to being labeled a 'narrative painter' in graduate school." 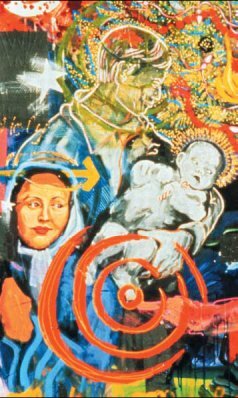 The painting, Brainstorm: Imagination Incarnate/Incarnate Imagination, considers Christ's imagination; the underlying words are "A GIFT VIVID AND KNOWING, DEEP AND LIVELY-WHO CAN KNOW IT?" It was made with a grant from the Pew Foundation. More of Michael's work can be seen at http://www.uu.edu/personal/mmallard/ and at www.civa.org. 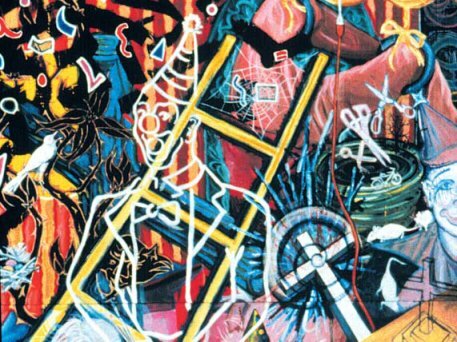 Detail of Clowning Around the Throne of God, 1991. By Michael Mallard. Acrylic and collage, 5' x 8'.